Divine love, longing, separation, and joy, has always been expressed through poetry. We hope you find inspiration in this collection of poems, written by Devi Mandir devotees from around the world. We are very happy to share this blog with devotees. Shree Maa suggested daily chanting of 3 malas of the Devi Prapannarti Hare mantra from the Chandi Path. May Mother fill our hearts with peace as we fulfill Her wish. To the Children of Faith. Is peaceful, deep and calm. With Our Hearts, Minds and Souls. With the blessings of our Gurus, we continued to make japa of the Devi Prapannarti Hare Mantra and have offered 1,228,704 mantras by December 15, 2010. Thank You! When love is tainted by selfishness, it cannot illumine at all. Self is lovelessness; Love is selflessness. Love gives and forgives. Self gets and forgets. Love can never entertain the idea of revenge, for it sees all others as Oneself. When the tongue is hurt by the teeth, do you seek vengeance against the teeth? No, they both belong to you and are integral parts of your body. So too, when some other person insults you or inflicts pain, allow wisdom to have mastery over you. Discover the truth and do not rush to conclusions, always keeping love as your guide. This is a difficult task, but not beyond your capacity. Embark on this task with ardor and faith, you will attain sweet victory. Namaskar Tya Shree Maa Ni Swami Ranaa. A devotee shares his love and devotion to Shree Maa and Swamiji in this beautiful poem in Marathi. Meaning: You are petite and you wear Yellow clothes. Your hair is open as is of Kesi Ari (Krishna). You have Bindi on your forehead as if that’s your third eye. We Bow to Shree Maa and Swamiji. Meaning: Isn’t it a great surprise that a Westerner has so much love for Indian culture and India ? He is full of wisdom, intellect, Seer and knows everything. We Bow to Shree Maa and Swamiji. Meaning: Swamiji meditates on Rudrastadhyayi and Chandi. He relieves our fear of this world. He continuously meditates on Maha Durga. We Bow to Shree Maa and Swamiji. Meaning: Shree Maa is Sharada Maa reborn. Swamiji is Jesus Christ in Orange Clothes. They always do Aarti to Ramkrishna. We Bow to Shree Maa and Swamiji. Meaning: Shree Maa lives in Devi Mandir on the top of the mountain. In Devi Mandir there is Durga’s Lion who drives away Kali by his load roar. Shree Maa is Saraswati with Veena in her hand. We Bow to Shree Maa and Swamiji. Meaning: In Devi Mandir there is continuous recitation of Chandi. 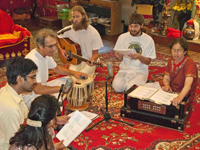 You are liberated from life-birth cycle by listening to Chandi. Shree Maa knows what’s going on in our mind. We Bow to Shree Maa and Swamiji. Meaning: Upendra is suffering, sad and angry. He is mean, selfish, has bad Karma and not intelligent. He can’t control his mind after trying out several options. We Bow to Shree Maa and Swamiji. Meaning: Upendra still urges and prays to Shree Maa and Swamiji. His heart has become wet because of praying to them. Now his heart is ready for Shree Maa and Swamiji to grow crops of their grace in his heart. Now Upendra can’t live without them. We Bow to Shree Maa and Swamiji.